Places to buy food, buy boat fuel, and launch your boat. So it's summertime and you're hungry. What's a family to do? You could prepare food at home, but wouldn't it be more fun to go by boat? Well, Sparky, this is your day. BIZER can tell you where to go, and we'll give you a choice of two lists: First we have a list of restaurants that are accessible by boat. However, if you prefer to buy groceries for that picnic on the lake, then go to the bottom of this page as we have a list of places to buy groceries as well. All places on this page have either private docking for customers' boats or they are located within walking distance of public docks. Be advised that some docking (both private and public) may be limited, especially on weekends in July and August. Olde Bay Diner (Breakfast and lunch. Check out their table covers). Sandy Point Restaurant; off map 0.1 miles southwest of light #23; limited docking for customers. Ames Farm Inn; 0.9 miles southwest of Diamond Island. (Grid H-12 on Bizer's chart); Breakfast and lunch; Usually open from mid-June through Labor Day; Some docking for customers. Lyon's Den (Formerly Townsend's Tavern) next to the Gilford public docks. Donna Jean's Restaurant (formerly Bridgeway) at Weirs Bridge (Docking for customers). Liliuokalani's Ice Cream and Coffee Bar (yogurt & pastries, too), 0.6 miles south of the Route 3 bridge; 0.3 miles northeast of light #82. Docking for customers. Margate Hotel; about 600m (0.4 miles) southeast of lighted buoy #60 in Paugus Bay. Akwa Marina, 0.4 miles northwest of Weirs Beach, has a public restaurant. Many walk-up walk-away fast food restaurants such as hot-dog stands, fried dough, etc. 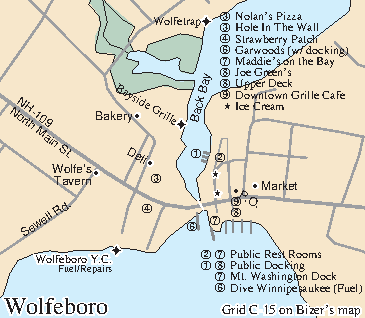 Restaurants accessible from Center Harbor public docks (See map below) (grid F-00) on Bizer's map. Pine Cone Cafe just east of Melvin Village. From the Tuftonboro public docks, just west of Melvin Village, it is a 0.7 mile (1.2 km) walk. Cow Island. The "restaurant" on Cow Island is not really a restaurant. It's more like a catering service. It serves a fixed menu at fixed times to groups of 20 (+/-). They're usually booked for the entire summer by mid May. Rather than dine out, you've decided to eat at sea. Maybe you want the full variety of a supermarket. Maybe you're boating along and you just have a hankering for a Pepsi and some potato chips. Well, BIZER has been all over this lake and we'll help you locate those groceries. Well, this list provides all types of groceries from full service supermarkets to teeny-tiny convenience stores. If you want a list of restaurants, go to the top of this page. This list is clockwise around Lake Winnipesaukee, starting in Tuftonboro. The map grid on Bizer's chart is also given. NOTE: On weekends in the summer, there may be a wait for parking at public docks. 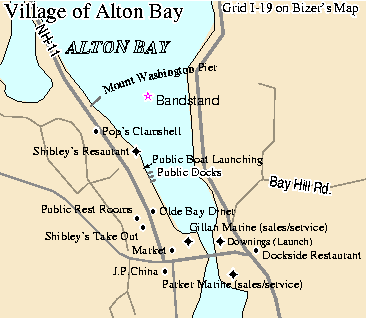 Pier 19 Mini-mart with docking for boats; Nineteen Mile Bay, Grid B-09 on Bizer's chart; 1.0 miles east of light #11. Bizer has never had a problem with parking here. For speed, Bizer suggests that you navigate on the northeast side of Chase's Island because there is a NO-WAKE zone between Chase's Island and Farm Island. CAUTION: watch for automobile traffic as you walk across route 109. Hunter's IGA Super Market; 60 South Main Street, 0.1 mile from town docks. Walk up the hill and it's on your left. Convenience store located at Channel Marine; Grid K-05; in Weirs Channel; 0.5 miles south of the Route 3 Bridge. Market located near the Weirs Public Docks, at the northern end of the pier. Convenience store located at Akwa Marina about 0.4 miles northwest of Weirs Beach. Grid J-5.